Greg Sterling reports on his blog and at Search Engine Land about Google’s announcing their new local advertising product called Local Listing Ads. Over 80% of people look to Google for local information. Make sure your listing stands out. You’ll hear “this call brought to you by Google” with every call from your ad. Try it out, risk free. You can cancel anytime. We’ll make sure your ad only shows to people near your business, with no work for you. 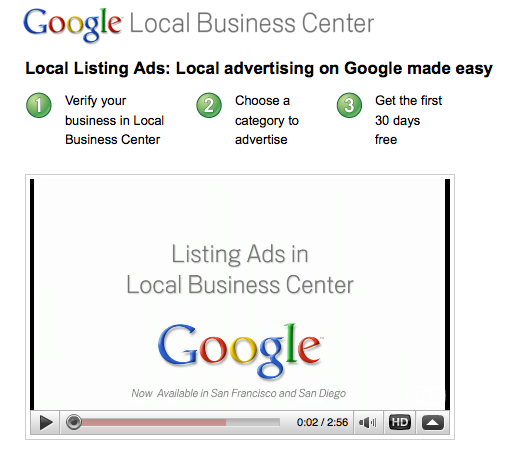 Local Listing Ads are currently available only in San Francisco and San Diego, CA. From a Google and Small Business Marketer’s perspective, I have to wonder what kind of resources – both human and financial – Google is putting into this new program to make it a success? Who is running the Local Listings program within Google – a Google Maps or Google Adwords team, the “Local Business Center” team, a new team or a not yet formed team? I think Google’s answer to this question lies the fate of the Google Local Listings advertising program.